The old myth that Britain was unprepared for war in 1914 has long been exploded.1 The Army actually had a good idea of the kind of war Britain should fight against a German invasion of France. The British Expeditionary Force would provide some limited aid to the French in defending their eastern frontier. Meanwhile, the Navy would strangle German overseas trade and destroy the German fleet in a great naval battle in the North Sea. Britain would thus be able to destroy Germany and restore a balance of power in Europe in a short war with minimal damage to her economy and trade. This was a perfectly reasonable assessment of the likely outcome of events in the summer of 1914. 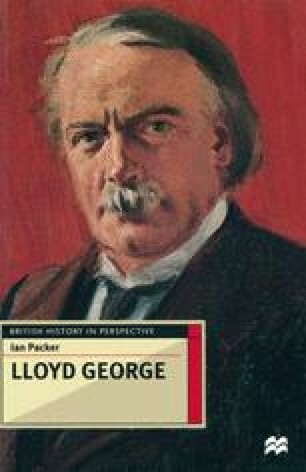 If it had proved correct the Liberal Party would have emerged unscathed from the conflict and Lloyd George’s career would probably have remained within the bounds of the existing party system. Unfortunately for the Liberal Party, the experts’ predictions proved totally inaccurate. No decisive battle was fought on either the Western or Eastern Front and the war settled down to the stalemate of the trenches. By the time the war ended in 1918, over five million British men were in the armed forces, more than 700 000 had been killed and the economy had suffered massive dislocation. But there was no revolution, remarkably little disaffection and a huge upsurge of patriotism. Under the strain, though, the pre-war political system broke asunder, destroying parties and forging new and strange alliances. The ultimate beneficiary of this was Lloyd George, who gained the premiership, something he could not have expected before 1914.